Shredding fallen leaves is a key step in using them as mulches and compost. Leaves left unshredded can take two to three years to decompose completely. Shredding speeds up this process so the soil can benefit sooner. Partially decomposed leaves are rich in minerals, buffer soil pH, and can be used as a substitute for peat moss when amending garden and potting soil. They can be placed directly on the garden, or composted for up to a year before use. 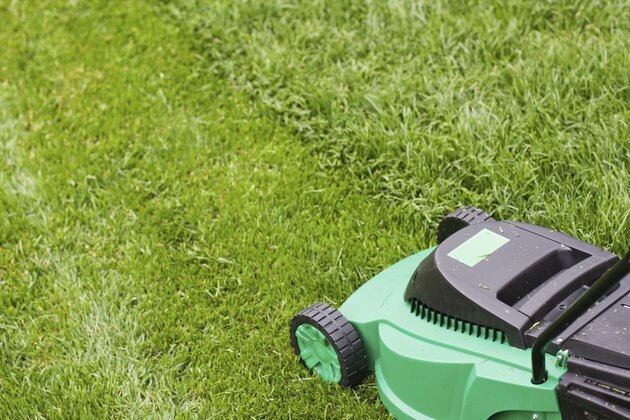 Commercially available leaf shredders may be expensive, but a lawn mower can be converted into a DIY substitute. Several styles of push mower can be converted into a leaf shredder. Cut a 4 1/2-inch by 8 1/2-inch hole in the front of the mower deck. If there does not appear to be enough space on the deck, turning the engine 180 degrees and remounting it can make more room. Cut two sheet metal panels for the front and back of the hopper using tin snips. Each panel will be wider at the top than the bottom to create a tapered hopper. Front and back panels measure 17 inches tall by 13 inches wide at the top and 8 1/2 inches at the bottom. Leave metal flaps on the bottom edges for mounting the hopper on the deck. Cut side panels measuring 17-inches tall by 12 1/2 inches wide at the top and 4 1/2 inches wide at the bottom. Leave metal flaps on the edges of the side panels for connecting them to the font and back panels, and on the bottom edges for mounting. Connect the hopper panels together using fastening hardware, lapping the flaps on the side panels over the front and back panels. Attach bottom flaps of the hopper to the mower deck the same way. Flatten and bend the ends of the metal tubing, and attach it to the back of the mower and the top of the hopper as braces. This will stabilize the feed shoot hopper and complete the project.